The text on the back of the sleeve of this South African E.P. is almost as good as the music: “Who of us, whether South Africans or visitors from overseas, are not fascinated by the impromptu enthusiastic street corner African jazz musicians. They are a feature around the streets of most South African cities, particularly in areas of predominant flat dwellings such as Hillbrow Johannesburg, where they can be sure of large appreciative audiences (yes, they are pretty good at catching the cents without missing a note) from the balconies of the surrounding buildings. The music is simple but it expresses the happiness and inborn feeling for bright foot tapping rhythm. Their instruments are mostly primitive such as “tea box” bass, improvised guitars, penny whistle flutes and “voice” instruments in wide and amazing variety. 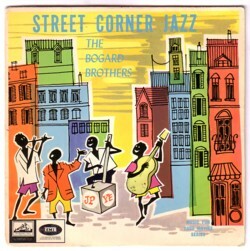 The young Bogard Brothers have developed from this type of music, but they still retain the characteristic sound. On this record are four titles truly synonymous of this unique African sound adopted to present their ROCK AND TWIST. In this field the numbers are definitively the top tunes of the moment and overseas vistors who take this record back home will treasure it as a vivid reminder of their stay with us. In one the songs (Flying rock) I clearly hear the sentence ”It is time to spend all your money, it is time to kill a man with a gun” , which sounds more as latent aggression than as happiness to me. The record was probably made in the early 60’s, maybe even in the late 50’s. In that period black people were treated as slaves in South Africa. But let me stick to the music. I find this an interesting record, because you can hear the impact that rock’n’roll had on the world. These guys probably didn’t have a record player, but they have heard enough Little Richard and Elvis Presley to use fragments of their hits in their own songs.